Lyx Beach Front Apartment. Med utsikt över den vacker muromgärdade trädgården. Vi är fullständigt registrerade hos, och godkända av andalusiska Govermement för korta semesteruthyrning och har alla de juridiska kraven som behövs och insisteras av de andalusiska turistmyndigheterna. Detta ger dig lugn och ro när du bokar hos oss, som finns på andra uthyrningsegenskaper som finns i området. Vår familj renoverade och renoverade vår lägenhet 2004. I januari 2017 genomförde vi en annan fullständig renovering, installerade ett nytt kök, nytt badrum och installerade luftkonditionering. Vi köpte nytt högkvalitativt vardagsrum och utemöbler. Vår första våningen, Palm Beach Apartment har allt du behöver och mer för att du ska ha en underbar semester. Palm Beach Apartments är ett säkert, gated community. Tillträdet begränsat till boende och gäster. En bra bas för att koppla av och njuta av stranden, poolen eller utforska det lokala eller större andalusiska område. Lägenheten består av ett dubbelrum med högkvalitativa ortopediska madrasser, duschrum. rymligt öppet vardagsrum med en BoConcept, bekväm dubbel bäddsoffa, plus en fantastisk läderstolstol. Det fullt utrustade köket / matsalen är helt ny för januari 2017. Vi har en Nespresso kaffebryggare och levererar minst 10 blandade stärkande komplementära pods. Inredda och möblerade i avkopplande neutrala färger. Vi har tillgång till WIFI internet och ett stort utbud av engelska TV-kanaler. Luftkonditionering i både vardagsrum och sovrum. Den stora balkongen har en fyrsitsig bord och stolar med ytterligare solstolar och över ser den muromgärdade gemensam trädgård och pool. Bara perfekt för al fresco äta och koppla av med ett glas vin eller en kopp te. Trädgården är tänd på kvällen och för fred, är lugn och säkerhet låst från 09:00 till 09:00. Rymlig, helkaklat och renoverad i februari 2017; med lätt justerbar dusch, toalett, handfat och förvaringsskåp. Tvättmaskinen är också i duschrummet. Having stayed in various apartments in Los Boliches over the last eight years we noticed the excellent reviews for this property. Consequently we managed to secure a booking for this year and to our delight the reviews proved correct. The standard of this accommodation is superb, having been recently updated the owners have carefully thought through the changes and we were amazed how a single bedroom apartment could be so spacious and comfortable with numerous extras included. The owners provided so much information before our visit we started to enjoy our holiday as soon as we arrived. The only problem is that we now will have to judge all other properties with this one which will reduce our choice substantially, so much so we have already had to rebook this apartment for next year so as not to be disappointed. Thank you Robert for your kind comments. We are so pleased that you and your wife enjoyed your stay . It was a pleasure for us too, to have guests who appreciate the love and care that we put in to ensure that your holiday is a memorable one. We look forward to welcoming you back again and again. Great location with beach restaurants and shops on your doorstep. Well what can i say. It has been the best holiday ive had in a very long time. Christine had been so helpfull from start to finish. She made my holiday stress free. Step by step directions from airport to train to apartment to resturants to supermarkets.The apartment had all the necessities. Modern furnishings, big balcony and located in the heart of all you need for a relaxing holiday. You really couldnt ask for more. I will definitely be back again and be highly recomending this appartment to family and friends. CHRISTINE HANCOCK, your dedication to detail and helpfulness to those who rent your apartment is 100% 5* all the way. Thank you so much for your very kind and helpful review. We are so pleased that you had a relaxing holiday. Lovely apartment, well equipped with a great terrace which gets the sun from early afternoon until it goes down. Plenty of bars and restaurants nearby , others a short stroll away. Thank you Anne for your review. We are really glad that you had a lovely stay and a great holiday. Christine & Keiron's Apartment is absolutely beautiful and you can tell that no expense has been spared in having it tastefully, thoughtfully and practically designed and decorated. 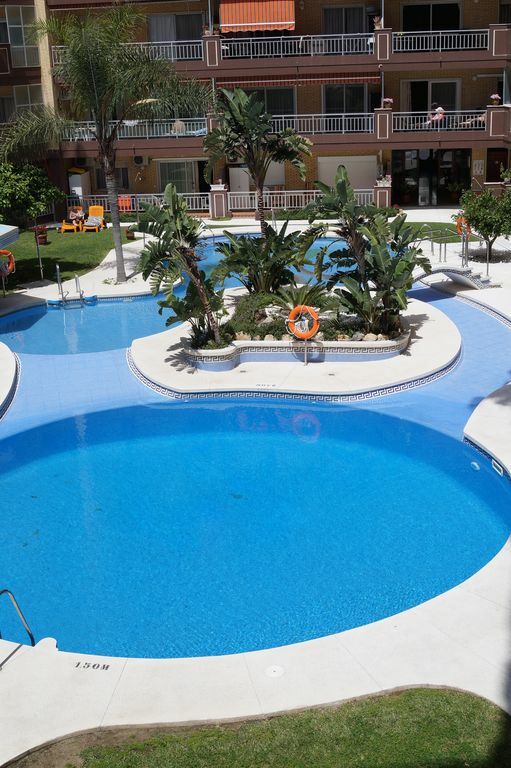 The apartment has everything you could possibly need on hoilday from Satellite TV, wifi, deck chairs, sun loungers, beach towels and all appliances. The location is ideal, directly across from the beach with 2 Supermarkets within a few metres of the building. There are bars and restaurants within easy walking distance and Los Boliches Railway Station is just a few minutes walk away. We had a wonderful time there and thoroughly recommend the Apartment. We would love to return next year and will be looking for a date as soon as we can get time off work in 2018. Thank you both for your very kind review. We are so happy that you had a comfortable stay and that you appreciate the love and care that we have put in to our latest renovations. Your tips on local ammenieties will be of great help to future guests. Keiron & I looked forward to welcoming you back again in the future. Mindre thanTwo min promenad till stranden! Över fem miles av gyllene sand som sluttar försiktigt i Medelhavet. Längs sidan finns en bred strandpromenad där människor promenad (eller jogga) långt in på natten. Fuengirola centrum och hamnen är runt en 30 minuters promenad och om du vill hålla på en annan 20 minuter till medeltida Fuengirola slott. Från Fuengirola finns en regelbunden färje till Benalmadena och även fisketurer och delfiner lokaliserings resor. För den äventyrslystne finns vattensporter också. Flyg till Malaga flygplats som ligger en 35 minuters bilresa / taxi från utväg. Vi kan sätta dig i kontakt med en lokal, engelsk taxi om du behöver och är billigare än en flygplats taxi. Biluthyrning att utforska är en trevlig att göra, men absolut inte nödvändigt eftersom kollektivtrafiken är billigt och enkelt. Så många platser ... så lite tid .. I bergen ovanför resort i Mijas en kort bilfärd, en traditionell spansk by. Fuengirola Castle har en fantastisk utsikt från toppen. Barer och restauranger är en eklektisk blandning av traditionell och modern spansk stil späckat med brittiska pubar, barer, restauranger. Det är verkligen något att vädja till alla åldrar och smaker. En favorit är den brittiska kör Salon Sorter Theatre i centrala Fuengirola, en stor utekväll. Vi håller en gästbok i lägenheten där våra gäster gör det egna beprövade rekommendationer. Booking Notes: Non-refundable deposit of £100 payable to secure booking. Balance due 8 weeks prior to departure, if not received by this date the booking will be considered cancelled.We will write to before cancelling. Last minute bookings can be accepted, subject to full payment being received prior to departure. All to be paid by bank transfer (BACS) or by cheque, subject to clearing timescales. Minimum age for booking is 25 years. Prices quoted are weekly rates of 7 nights or winter monthly rates for 28/30 or 31 nights. Unfortunely we can not accept bookings for less than 3 days. Keys sent by recorded delivery minimum of 2 weeks prior to departure. Keys returned to us by recorded delivery within 1 week of return form holiday. Changeover Day: Change over day can be flexible and arrival/departure time can be agreed at time of booking. Monthly winter periods are for the calender month ( eg. 1st to 31st of month ) and INCLUDE ALL ELECTRICITY & WATER CHARGERS. NO ADDITIONAL COST AT END OF YOUR STAY. We will always try to accommodate your flight times, however you may need to vacate by 10am earliest during busy periods. Please let us know if you have any special requests. Notes on prices: Prices are for the property, not per person, with a small additional charge of £10 for laundry when 3-4 people sharing. Maximum of four people sharing. Double bed linen is provided when there are more than two guests. Additional linen, cleaning and laundry services are available at additional charge on request. Prices included WIFI access & UK TV package ( BBC,ITV,C4, C5 etc,) Please note that lost keys will be invoiced at £40 - The local cost to replace the external doors is €45 + €10 for front door key. Bookings of less than 7 nights will be charged at the full weekly rate for the period.